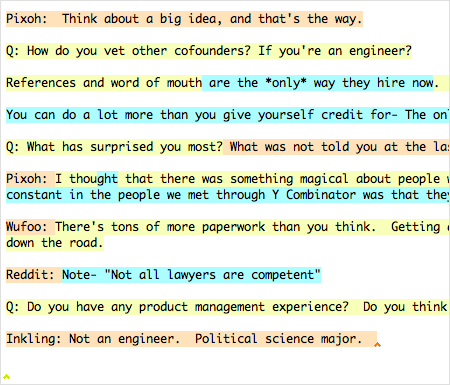 These notes from Y Combinator's Startup School were taken by about twenty people, simultaneously, using SubEthaEdit. I had never used SubEthaEdit in a group and it was an interesting process. Each color represents a different contributor. You can see other people typing in realtime, and you can see it when they select text, and you can see where they're moving their cursor. 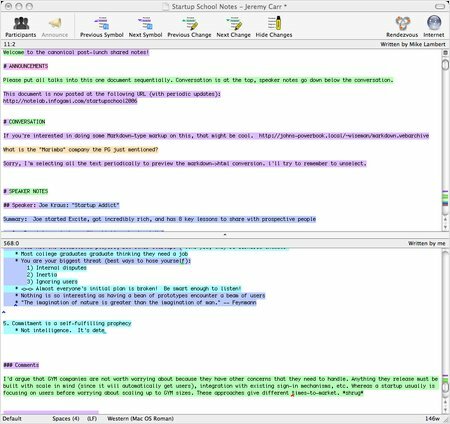 In the above screenshot, you can see examples where one person has created a template ("# ANNOUNCEMENTS", "# SPEAKER NOTES") and other people are filling it in. People are alternating in entering outline elements, and you can see that sometimes one person will enter a bullet and someone else will fill in some details. You can also see that there may only be a few people making significant contributions at any given time—I think a lot of people just wanted to watch the notes in case they missed something the presenter said. This screenshot shows some fine grained collaboration: There are people finishing each others sentences, fixing others' typos, and one guy caught the names and company affiliations of the speakers that everyone else missed and made sure all the answers were properly credited. A couple times I saw some neat stuff happen. For example, during Joshua Schacter's talk, someone had missed the beginning of a new section and was putting notes under the old heading. I selected the line he was working on, he saw that and stopped typing, i cut and pasted into the correct heading, and he resumed typing (I had been wondering why SubEthaEdit showed other people's text selections, and this perhaps illustrated the issue). 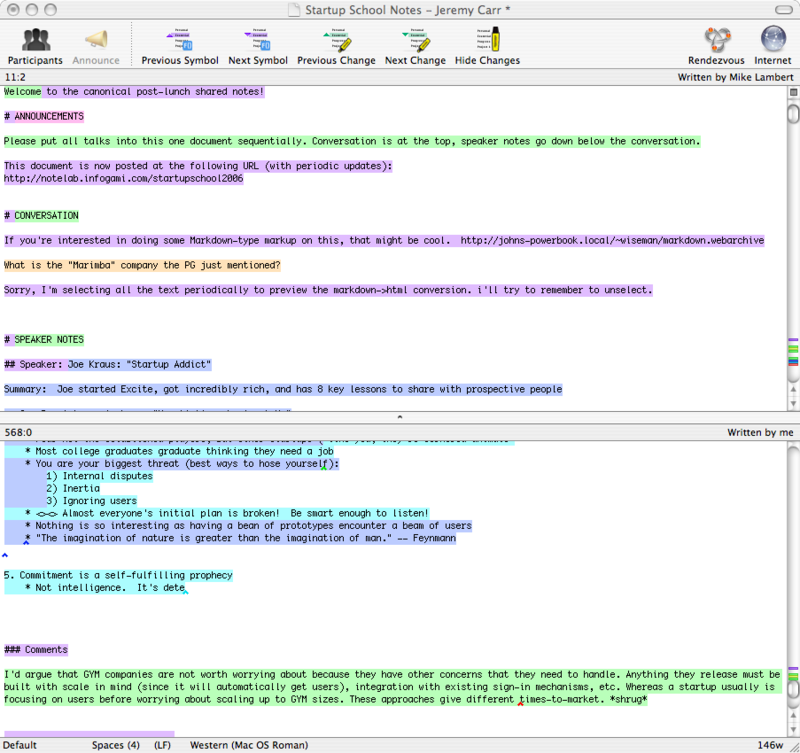 One or two people with previous SubEthaEdit experience laid out a decent document template to follow, with an area for real-time chat, per-speaker sections and a list of contributors. People did a pretty good job of filling in pieces that other people missed. SubEthaEdit's Bonjour support made it trivial to find the document once you got on the wifi network. Markdown let us create a document that looks OK in both raw text and HTML (I posted a Markdown reference and cheat sheet using OS X's “Web Sharing” which was available via a link-local hostname that didn't require a DNS server or anything on our ad hoc network). As far as I know SubEthaEdit is only available for OS X, so no Mac means no note sharing. Author information isn't persistent—if you save the file and reload it, you lose the color coded record of who wrote what. This happened across lunch, for example. In the list above I mentioned “the document” and “the wifi network”, but in reality we had three different wifi networks, two of which were named “SubEthaEdit” and “Subetha Group”, and each network had people running SubEthaEdit and working on different documents. It took a while to mostly converge on a sorta canonical document, and I'm not sure that there was a complete convergence. There was no head editor, and the final notes are something that Frankenstein might be scared of. I don't think any of us actually knew Markdown, and my attempts to learn quickly and work the document over into Markdown format as we went were only partially successful. We did post the notes frequently during the day to a web page, and doing that required an effort that was either Herculean or Sisyphusian. Dan Moniz brought a wifi access point with an EVDO card for internet access (Stanford's wifi network is closed, so we had no internet that way), but it was kind of flaky and we didn't want everyone to be affected by the unreliability. So I stayed on the SubEthaEdit ad hoc network and helped edit the notes, periodically saving to my Public folder. Dan would then use Bluetooth File Exchange to grab the notes from my machine and post them to the web through his wifi AP with EVDO backhaul. Periodically I would use my cell phone as a GPRS modem via Bluetooth to grab something I needed online. I was about to say that this was probably not the geekiest thing happening at the conference, but upon reflection I think it is in fact a strong contender for the top slot. Have you tried writely instead of subethaedit? www.writely.com provides through the web collaboration and is platform independent. It might be a nice way to get everyone to "build" the same document - though I'm suspicious of its real-time capabilities when the colloborators are in the same room. When my group was split between the east and west coast, SubEthaEdit helped us stay in touch and productive. We'd use it for meeting notes, todo lists, and for collaborative code authoring. I highly recommend it. Michael, I haven't tried Writely yet, but the thing that would have stopped us from using it is that we didn't have (reliable) internet access. We were just working on these ad hoc wifi networks. Joshua, that sounds like a good idea.